now available on DVD (+80 minutes bonus features!) and online streaming! When 81 year-old Leo Welch from the Mississippi backwoods skyrocketed to global Blues & Gospel stardom after releasing his debut record in 2014, it took the music world by surprise: Where has this guy been the last 60 years? Why has nobody ever heard of him? Answers are given in LATE BLOSSOM BLUES, a Documentary about Leo Welch and his very late rise to fame. It’s the quintessential Blues story – a story about poverty and exploitation, about The Lord & The Devil, and of course a story about life that reminds us that it’s never too late to live your dream. LATE BLOSSOM BLUES follows Leo and his ex-soldier manager as they balance the tight rope between business and geriatrics, between jetlag and soundcheck. It also paints a heartwarming portrait of Leo’s small hometown Bruce, MS, where Leo’s daily life is still untouched by his late global popularity. 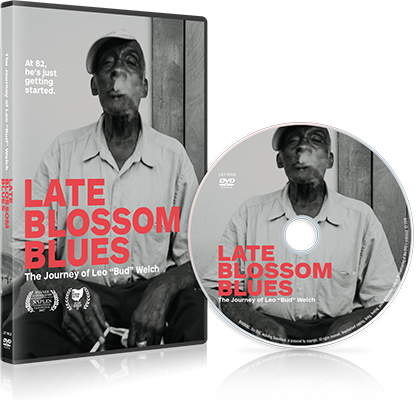 Documenting the most exciting times in the life of one of the last real Bluesmen, LATE BLOSSOM BLUES is a film of historic dimensions for all music-lovers – a moving account of a hard-working man, who, despite all the adversaries, never wavered from his passion and waited more than 70 years to finally live his dream. Want to be kept up to date? Sign up for our newsletter!